This Baby Spinach Pomegranate Salad is inspired by my recent trip to Athens. I was in Athens for the European Yogi Nomads event and we went to the most amazing restaurants. 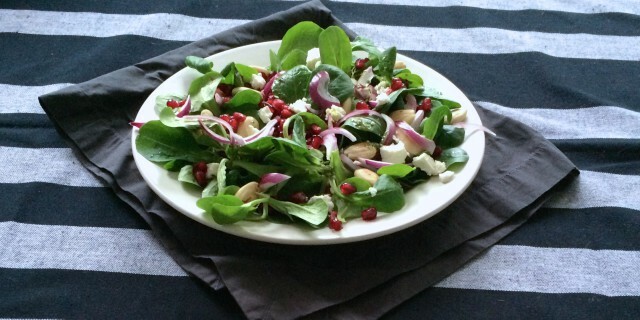 My most memorable dish was a delicious salad with baby spinach leaves, pomegranate and roasted almonds. If you are ever visiting Athens, pay a visit to Mama Roux and Tzitzikas kai Mermigas. They have the beautiful food and great salads. I have tried to re-create my favourite salad at home. This time I couldn’t find baby spinach so I used lamb’s lettuce instead. Both spinach and lamb’s lettuce work really well in this salad. Add baby spinach of lamb’s lettuce leaves to a large salad bowl. Add all dressing ingredients to your food processor and process until all ingredients are thoroughly combined. Sprinkle the dressing over the salad. Serve with thinly sliced red onion, pomegranate seeds and roasted almonds. You can crumble Greek feta cheese on top, if you like.